Now when we’re really starting to see signs of spring, I hope you enjoy my author newsletter for March, posted earlier this week. I’ve included a poetry study, a writing update, and this month’s writing tip. Happy writing! Thanks for the writing tip, Theresa! Right now here in Western Canada we are eagerly awaiting spring (see my photos in today’s post). 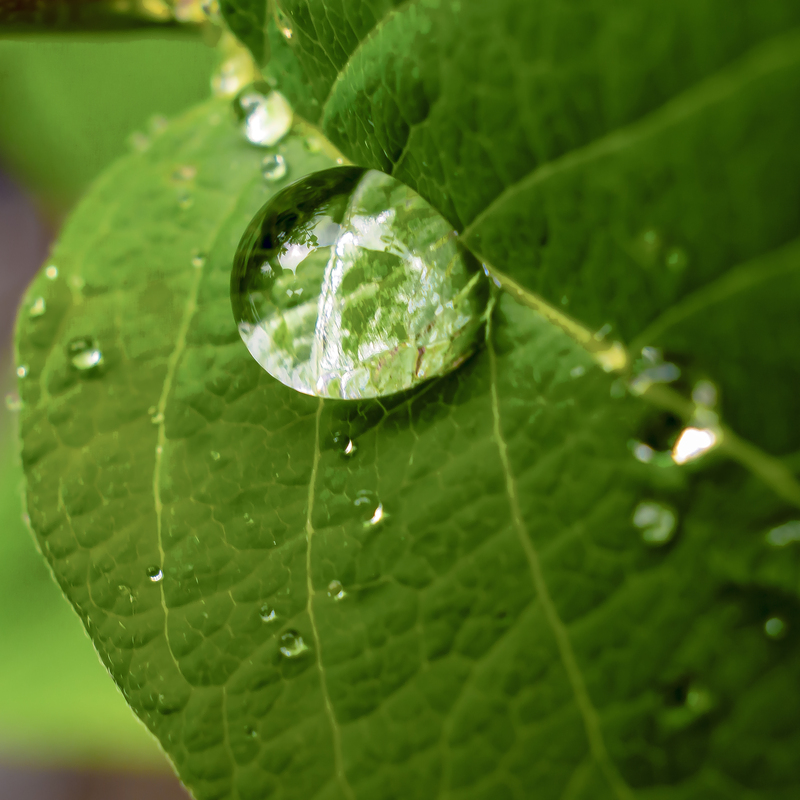 I like your photo of the raindrop on the leaf, a natural magnifying glass. Thank you for introducing me to your very cool site…I enjoyed everything on offer! Ah! Thanks Kimberlee! 🙂 Have a great day! I know what you mean about the shortage of hours in the day. Reading, reading, reading can be hard to fit in. Even harder: what to read? These days the new books lists seem to be full of very difficult stories of abuse, violence, hatred . . . perhaps mirroring the world? It can feel discouraging. I was surprised to read of your interest in my little garden. I had not checked on it! This weekend I went out and I took some more photos. So far, so good. The plants are still there, no one has trampled them or yanked them out . . . it’s a little bit of a public place at the end of the road, so you never know. But so far. I’ll include the photos in an upcoming post! I did sneeze a lot! Over here if one sneezes or has hiccups it is because someone is remembering us 😀 I am really touched, excited (and flattered!) to know that you read about Dahlia’s trees half way across the world. How cool is that! You are so good at your selection of poems that I actually dare not delve into that world and come out disappointed and like you said, even disturbed. So I shall stalk your blog for pearls and gems 😀 And now photos of your little garden! Aha! I know you must have been sneezing because of my reading. That’s a wonderful connection. And thank you for your encouragement about poetry, I’ll be glad to continue. Yes, it takes persistence to find a poem that really speaks to one. 🙂 Glad you’re back to blogging! I love the poem and the style it was presented. The author wants the reader seduced into imagery and become like the stone… there. I love rewriting other people’s story, it makes you rethink each word with the author’s and your eyes and challenge your muse to bring it on. We are finally turning green here in New Jersey. We still have traces of last week’s storm but it is fading with each day. I never mind spring storms, because beggars can’t be choosers when it comes to poor man’s fertilizer before the heat of summer appears. A pair of hamsters named Marley, that’s a lot to live up. The dog, Scrooge’s ghost, Good thing they didn’t see the movie Dumb and Dumber. Lyn! Thank you for your lovely thoughtful commentary. I’m so glad to catch up with you! I appreciate your thoughts about the poem, and more so because you are a poet! I think you are right about the rewrite being a way to rethink the author’s words and adapt the story to your own way. Turning green in New Jersey! Yay! When I was in Boston in January it was brown, brown, brown. Brr! I was puzzling and puzzling about your reference to “Scrooge’s ghost,” and then it hit me! Marley (as in, “Marley was dead.”). Silly me. I must have been thinking of Bob Marley, and reggae. Hah! You’ve been in my thoughts, Lyn! How are you feeling about your novel projects, as I remember you did a novel course last summer, and then there was the brave NaNoWriMo project you did in November. I hope you still feel good about your accomplishments and progress from 2017! And at times I wonder about your Airbnb business, I still remember the delicious scones you wrote about. How’s that going, still good? The airbnb is going slow right now. I kinda expected that with the crazy weather. I’m starting to get bookings for the spring already especially in May. I’m frustrated with the book right now, so I’m working on 30 days of poems on death. I’m feeling good with this goal. Death is such an amazing subject and hopefully it will get me back on track with my book. Oddly enough, we’re beginning April with another snow storm. I feel for the daffodils, forsythia, crocus, and muscari, they’re all getting a cold blanket. I’m so over this weather. It was 60 on Saturday. How’s your writing projects going? Wonderful poetry! And definitely great author newsletter. You are so inspiring, as always. Writing stories from different perspectives is quite interesting. I sometimes think about changing my initial perspective, say shifting from the female protagonist to the male counterpart in a love story. It will definitely change the story. 🙂 You’ll be fantastic with this, Anne! Aw, thank you, Theresa. Your encouragement is always, always much appreciated! Much love my friend. Hugs.